On Friday, October 28th, we woke up at 5:00 am to take a taxi from our wonderful hotel in the center of Cusco (Inkaterra La Casona) to the Poroy train station. The journey took about 20 minutes (18 km) and we arrived with a little time to spare before catching the “Expedition 33” train at 07:35 am with PeruRail (80 USD per person). 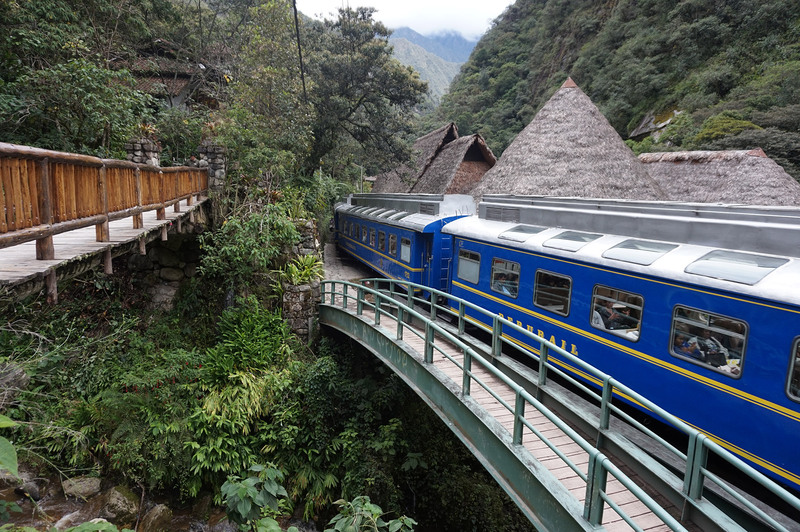 We would leave for Aguas Calientes, a small town that serves as a home base for all tourists who are on their way to Machu Picchu. While we waited at the station, we bought some coffee and baked goods at the bar that was already open. When the time came, people gathered at the entrance and began to move towards the platforms. There were many people, however the wait was very short as the ticket control system was automated like in airports. Once we accessed the platforms, we headed to carriage C and got in the queue. A very friendly girl, an employee of PeruRail, indicated that we could use carriage A, which was less busy and so we headed over there. At the entrance of carriage A was Jorge, the train manager. Jorge was very friendly and told us that we could sit wherever we wanted. We left our hand luggage at the entrance, on the shelves intended for luggage, and chose the first seats in the carriage. They had a table in the center and 2 large comfortable seats on each side. We were incredibly comfortable and very happy to not have anyone sitting next to us for the entire ride. The first thing that caught our attention was how the carriages were decorated. There is an air of Inca culture that prepares you for your touristic visit to Machu Picchu. 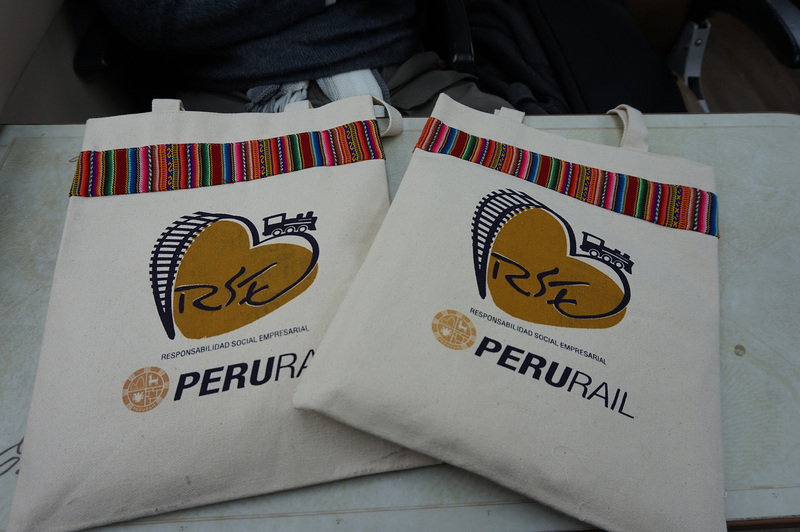 As we looked around and the train started moving toward its destination, Jorge approached us with bags containing small gifts. Inside there was a notebook, map, pen… It was a really nice touch. While we were moving and enjoying the scenery on both sides of the train, the train staff came over to us to offer us a drink and a snack. 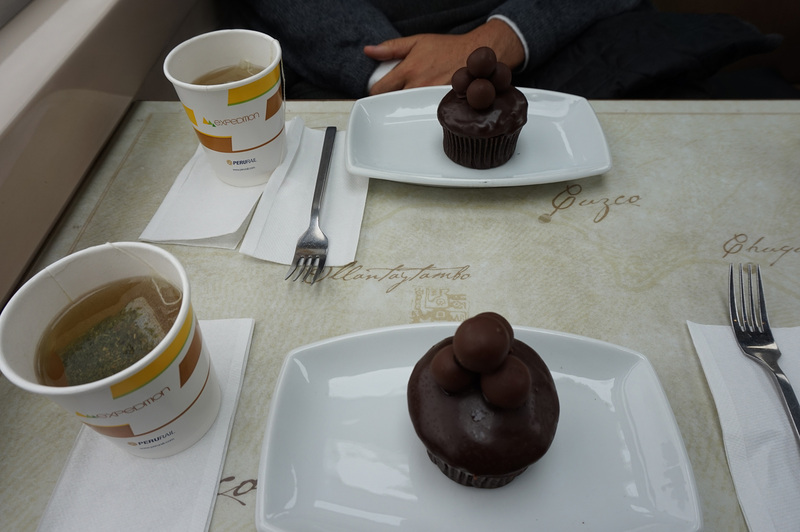 They had sodas, water, coffee, teas, etc., and we chose a coca leaf tea and a delicious chocolate muffin. The staff is worth mentioning because they were tremendously gracious, always asking if everything was okay or if we wanted something else. Soon sleep came over us and we nodded off for a bit. Getting up so early had taken its toll! We were able to sleep for about an hour as the train is very quiet and smooth. When we awoke, we were already passing through small valleys between giant mountains, surrounded by vegetation and following the course of the river, as if we were the first explorers. No matter where you looked, left or right, the natural beauty of that place was like no other… we had never seen anything like it. The mountains on the sides were so large that we could barely see the sky. 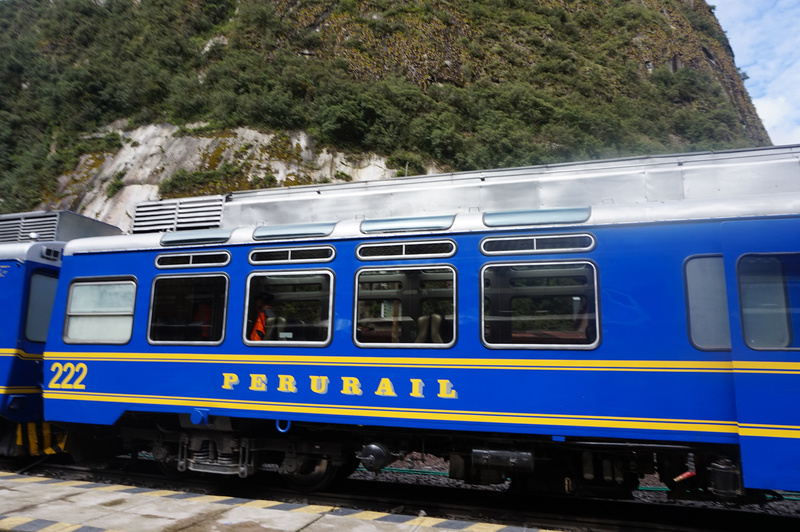 However, the PeruRail trains are designed so you don’t miss a single glimpse of the wonderful views. 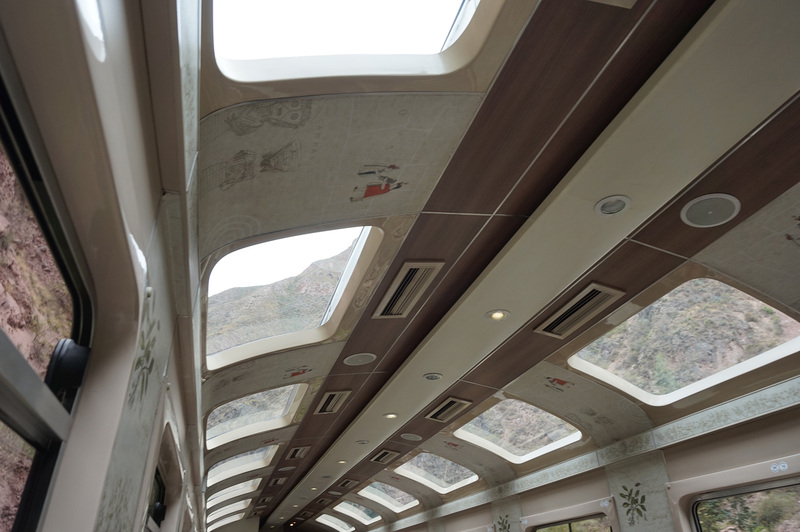 Each carriage has glass windows on the ceiling, so you only need to look up in order to enjoy the mountain tops. We spent the rest of the trip looking up, down, left and right, as the scenery was amazing. After 3 hours and 17 minutes, at 10:52 am, we arrived at Aguas Calientes (Machu Picchu station), where a person from the Inkaterra Machu Picchu Pueblo Hotel was waiting for us. We left the train without hesitation and headed to the hotel. 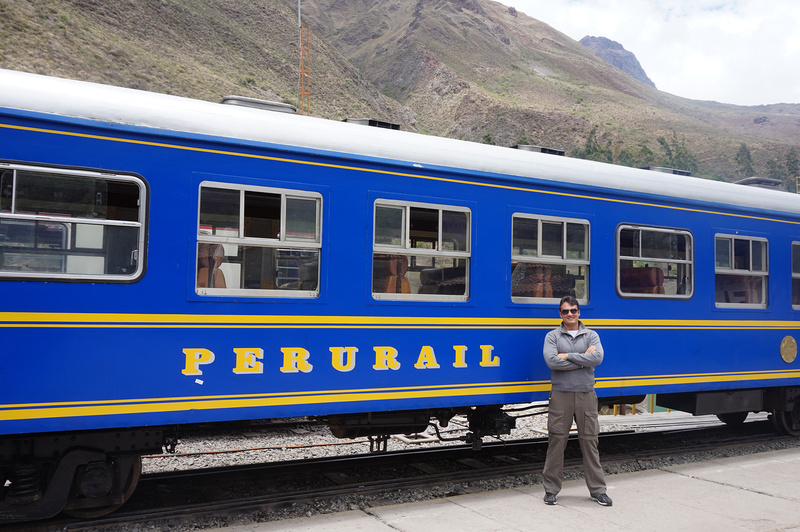 The experience with PeruRail Expedition was great and the price we paid for the train was very affordable. After getting to the hotel we changed and headed to Machu Picchu. There we hired a guide who was with us for two hours and explained every last detail about that wonderful place, so magical and full of mystery. 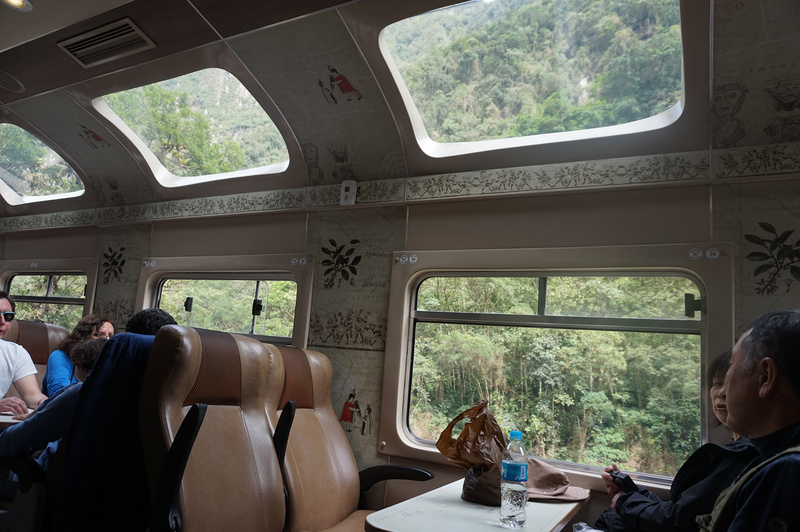 After spending the night in Aguas Calientes (Machu Picchu), on Saturday October 29th we took the “Expedition 72” train from Machu Picchu to Ollantaytambo (50 USD per person). It left at 08:53 am and arrived at 10:52 am, a journey of approximately 2 hours, much shorter than the way down. The train was the same, with the same amenities and staff. We did notice that this time they offered us sweaters and high-quality alpaca scarves that we did not buy since we had stocked up on them in Cusco. 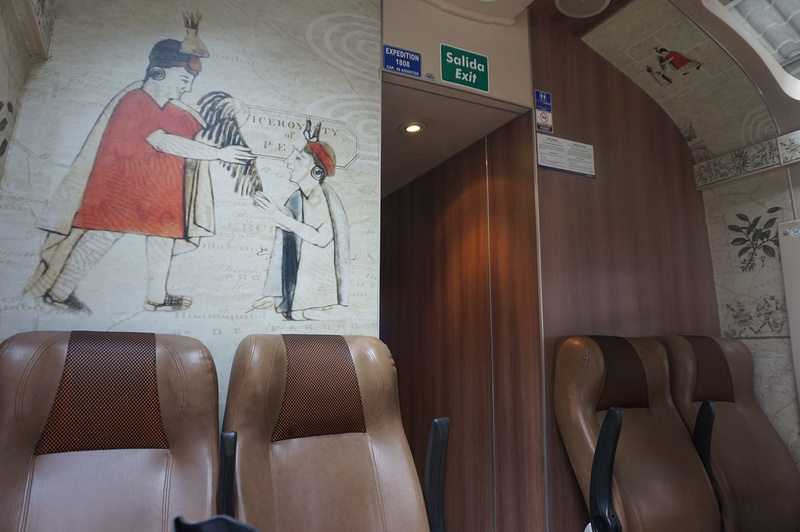 In short, PeruRail’s Expedition train is a great option considering the price and quality of service.